Lemon GreenTea: Get the chance to get free delicious treats when you drop by a McDonald’s Drive-Thru! Get the chance to get free delicious treats when you drop by a McDonald’s Drive-Thru! 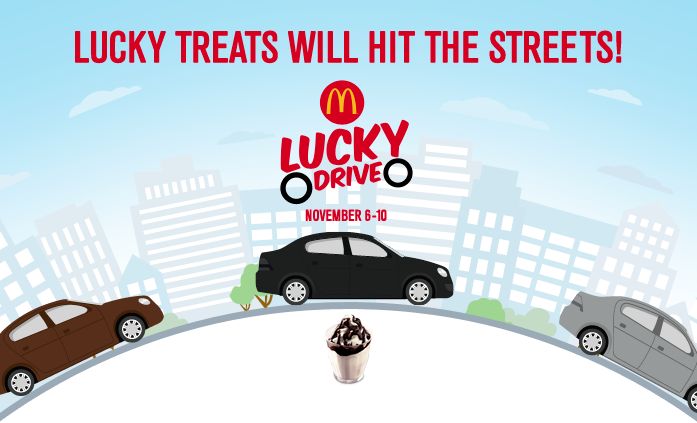 Here’s some great news: McDonald’s is kicking off November with the return of Lucky Drive! Get the chance to get free delicious treats when you drop by a McDonald’s Drive-Thru! What better way to get through the week than to have something to look forward to, right? Getting stuck in traffic (especially during rush hour!) is slightly less stressful when you get a lucky treat while having your McDonald’s fix. Starting yesterday till Friday, November 10, be one of the lucky Drive-Thru customers in Metro Manila, Cebu, or Davao. If your car happens to be the Lucky Color of the Day, you can get a free McDonald’s treat. Watch out for the specific time and color assigned per day on McDonald’s Facebook and Twitter pages, and the list of participating stores via www.mcdonalds.com.ph, so you can perfectly time your McDo fix this week. So what are you waiting for? Drive by and you just might be one of the lucky customers to get free McDo treats – like McCafe Premium Roast Coffee, Coke McFloat, or even a Burger McDo! Tell your friends and loved ones that McDonald’s Lucky Drive is here. Don’t forget to share your photos on Facebook, facebook.com/McDo.ph or tag @McDo_PH on Twitter or Instagram and use the #McDoLuckyDrive. Labels: Lucky Drive!, McDonald’s, McDonald’s Drive-Thru!